Who needs a new vacuum?!? 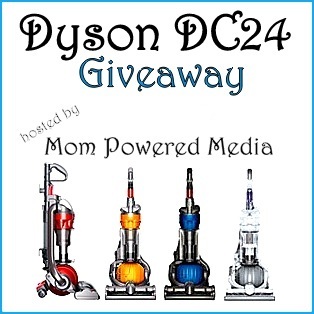 We have teamed up with Mom Powered Media and some other great blogs for one lucky winner to win a Dyson DC24 Vacuum! Woohoo! My “extra” bedroom…the Grandchildren watch t.v. & eat in there…but don’t tell GrandPaw! What room in my house WOULDN’T benefit? I would sing and dance and vacuum every day…for the first week at least. The living room/dining room area! We Have tile floors, with all the loose dog hair, I think all our rooms will benefit from this giveaway! living room/dinning room. I have pets and kids and that room gets a lot of use. The room I would get the most benefit, would be my living room and the high traffic areas like my hallway, thanks for the great giveaway! any room!! but I think our living room takes the biggest beating from the 3 kiddos! All our rooms would benefit, but we spend the most time in our family room, so this room would really benefit. Sweet niblets, which home wouldn’t benefit! I guess mostly my living room, it gets most of the traffic. Thanks for all your killer giveaways! You rock! Our main living area would definitely benefit the most!! If I really had to choose, I’d say the living room since that gets the most foot traffic. omg my living room! My teenage son is a PIG! The Living room, if I have to pick one, but it really would be great for the whole house. The hallway – I used to have a puppy who thought it was her bathroom apparently. Tiny little round stains everywhere! When it says to “Like Mom Powered Media on MBS” does that mean Join? I can like a post or join but I didn’t see a “like” button…. Our living room needs this the most. It’s where our two cats most like to hang out. My living room! There is always either pet hair or something else on the carpet! Our Lounge room gets used the most so it would really benifit but not only carpet but I vacum every were. My family room would benefit greatly form the Dyson. Looking for the ideal vacuum cleaner! the room the would most benefit would be my living room….and my vacuum has went kaput! For sure my living room (plus every other room in my house) could use a dyson vacuum to sweep up all the dirt, dust, dog hair , and dander! My living room, it get the most traffic. The family room could use it most. My bedroom would most benefit!!! Definitely my kitchen, 2 hungry boys are forever dropping crumbs! My living room would get the most benefit from the Dyson vacuum, because that’s where everybody walks and eats chips and popcorn to watch TV. definitely the den where it seems all the stay! The dining room where my two golden retrievers hang out and shed 24/7 and we eat all our meals. Have always wanted a Dyson, so lightweight but powerful! my living room! We have 5 cats in here! For sure my livingroom! Dog hair everywhere! My bedroom. I don’t have carpeting in any of the other rooms in the house. My living room carpet is light colored and is constantly covered in pet hair. This dyson would be great for that! May this sweeper is lighter than mine & easier to use too.. I would use the Dyson all through my house as we have two cats who spend their time rolling around, shedding their hair! I would use this through my whole entire house. My friend has one and she is disabled like I am and she loves it. I cannot afford one and would love to win this. What a wonderful birthday gift this would be. One can only hope and dream to win. My living room would benefit most. My bedroom could really use a good cleaning! Our family room needs a good cleaning. My boys’ rooms have long carpets. They could really be cleaned! All of them! Mostly the living room, though. My living room for sure! The living/Family room for sure! I would like this for the bedroom. The long dog hair seems to show up there the worst! The greatroom would love this vacuum. My hallway and sons room would get vacuumed the most! My living room would totally benefit from this vaccum. It’s a toss-up between the living room and the boys’ room! The livingroom which is basically the main family room. Big carpet. We also have another living room in the house too. My living room would benefit the most, highest traffic area. the living room we have 4 dogs…. My den would most benefit from a dyson! The living room for me. The kitchen would be the most useful as it has the most traffic. My living room with all the dog fur. I live in a house with the “hogs from H***!” so it needs vacuuming about every day! The 2 living rooms, where we(as in pets too) mostly gather & high traffic!! My living room sees the most activity, especially with children, and would benefit the most from this vacuum. My cousin has one and just loves it! 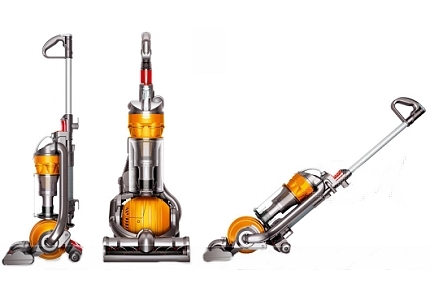 OUR LIVINGROOM WOULD BENEFIT MOST FROM THIS VACUUM. I LOVE THE WASHABLE FILTER! The whole house but mainly the living room where all the dog fur tumble weeds seems to accumulate. Living room!!! Its where my baby plays and needs to be clean. Living room always needs some tlc! I need this Dyson so badly! I moved my elderly Mom and Dad in and they eat on TV trays in the living room and they are worse than toddlers learning to eat! I really need this. Thanks for the give away! No question – the living room! my dining room, that’s where my cats shed all their hair! All rooms, especially the living room. It would for sure be my living room, my kids make huge messes in there. I would definitely use it in my living room. We have 2 wonderful dogs and if anyone out there knows about Golden Retrievers then you know how “hairy” my furniture gets! My family room would benefit the most. The bedrooms and hallways. Thanks for the giveaway! The house house….I live in the desert. My whole house needs to be vacuumed on a daily basis because I live in the desert in Arizona. The family room would benefit the most. My Living room, it is the room that we spend the most time in. i need this for our living room, it gets a lot of traffic and we have a dog that sheds like crazy! Our family room, because that’s the room that gets the most traffic. The bedrooms! 🙂 Thank you. My living room carpet always needs vacuuming. Thanks for this giveaway! Absolutely the living room! So much animal hair. Goodness! This would be great for my living room. My bedroom would benefit most! The room that would most benefit having the Dyson is our Living Room and Dining room. It is an open air room plan . My kids room needs the Dyson to pick up their mess!! I would use the Dyson most often in my bedroom and living room. MY LIVING ROOM COULD USE THIS THE MOST MY VACUUM I HAVE NOT WORKS OK BUT I HAVE TO GO OVER MY CARPET A CUPPLE OF TIMES BEFORE IT WORKS RIGHT . I would use it in every room !!! Thank you so much !! !